Rainforests in West Africa are quite different from rainforests anywhere else for two very good reasons………..one, that their existence depends on a unique weather pattern known as the Intertropical Convergence Zone (ITC) …….and two, because the region has dried out and cooled down a number of times in the past. West African rainforests can be likened to a filling between two slices of bread – the Atlantic to the south and the Sahara to the north – which produce a soggy or dry sandwich depending on pressure from the ITC. During the course of the year the ITC moves, shifting north and bringing warm moist air from the ocean – the rainy season - and then moving back again, pushed by cool dry winds from the desert – a phenomenon known as the Harmattan which fills the air with a mist of dust and coats every surface, including your lungs, with the finest airborne particles of sand. Before it changes direction in July or August, the ITC may reach as far as 20˚N of the equator, which can bring rain into the Sahara itself. Any rainforest close to the equator is guaranteed to be hot and wet all year round, but West Africa is not quite close enough to bring this guarantee. Instead, it has four different kinds of rainforest depending on how far they are from the equator and to what extent they are affected by the huge mass of the Sahara. Rainforest closest to the equator is termed wet evergreen forest (annual rainfall 1750-2000mm) and in West Africa it occurs only in southernmost parts – in Nigeria from around Lagos to Benin City and down to Port Harcourt and Calabar. Next come areas of moist evergreen forest (1500-1750mm) and after this there is moist semi-deciduous forest (1250-1750mm), which is the largest single type in West Africa and the one with the tallest trees. In this kind of rainforest, diminishing rainfall and a pronounced dry season cause many trees to lose their leaves for months on end. But most extreme of all is the dry semi-deciduous forest we have at IITA in Ibadan where three or four months of the year are bone dry and with average annual rainfall hovering around 1250mm, a high proportion of trees, climbers and other plants become dormant and leafless in order to survive. We are in fact in the transition zone, midway between 7 and 8˚N of the equator where forest meets savanna. Further south there is little concern about when it might next rain but here we are on a tightrope between wet and dry. Like the ancient Roman deity Janus, god of doorways and gates who is depicted with two faces so that he can look both backwards and forwards, this area could go either way with global warming. Another reason that IITA in Ibadan is so uniquely positioned is that it is in the far west of Nigeria and close by another major phenomenon – the Dahomey Gap. Situated largely in neighboring Benin, this startling geographical feature is a massive intrusion of savanna which reaches almost to the coast, cutting a vertical swathe through the West African rainforest. This creates a formidable barrier that many species of rainforest plants and animals cannot cross, which results in two different kinds of forest. To the west of the Dahomey Gap, from Ghana to Senegal, there is what is known as Upper Guinea Forest, and on the other side is Guinea-Congo forest which has closer affinities to forests in Central Africa. This puts the IITA Forest Reserve literally in a unique position as one of the few remaining forest fragments in the transition zone and an increasingly rare example of westernmost dry, semi-deciduous Guinea-Congo forest. Given that it is also well protected, there is perhaps no better place to monitor changes in climate and biodiversity. Human-induced climate change has never happened before and by definition is therefore unpredictable. Becoming drier is nothing new though. Indeed it would appear that this has happened several times to West African forests in the geological past, leaving pockets of rainforest only in the warmest wettest places and driving all else to extinction. This is another reason that West African rainforests are different from those in the Americas, Asia and Australasia. Everyone knows that rainforests have the greatest diversity of living things anywhere on earth and a high degree of endemism – species found in one area and nowhere else. In general you expect the highest endemism in very complex terrain – rugged mountains, diverse watersheds and varied rocks and soils - which creates innumerable niches and physically separates species which then evolve differently. Endemism in West Africa seems to be for a different reason though. For one thing, West Africa has no high mountain ranges like Central America, Borneo or New Guinea and is more uniform in its geology. The high numbers of endemic species in West Africa may therefore have more to do with survival against the odds in small pockets of rainforest when all the surrounding forest dried out. These are big generalizations of course, but they serve to give an idea of why rainforests in West Africa are the way they are, and why the last few remaining areas are so very special. 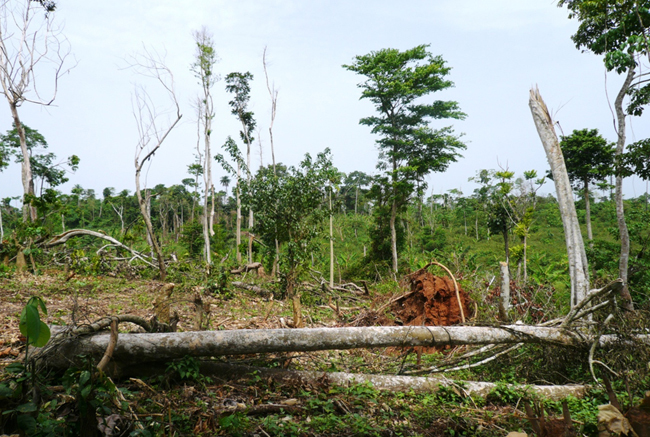 At present rates of deforestation, they will more or less be gone by 2020, and mostly before they have been studied in any detail or assessed in terms of their contribution to the environment and life in the region. That’s why even a small fragment like the 350-ha IITA Forest Reserve can have a big impact if actively managed for research, conservation and education as well as for the diversity of plants and animals that live there.